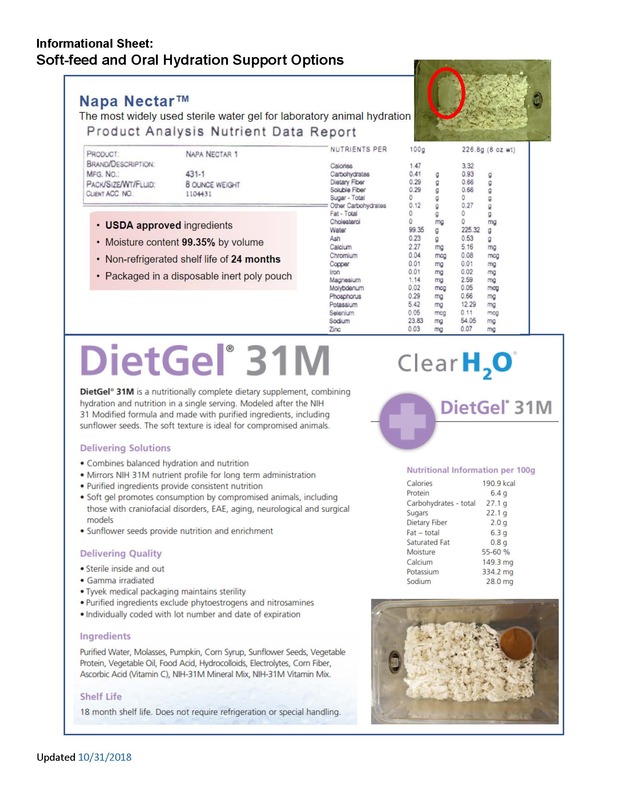 Purpose: The purpose of this document is to provide labs with adequate information needed to supplement mice with NapaNectar or Diet Gel. Some mice require additional nutritional or hydration support, especially small new weanlings, debilitated mice, paralysis models, post-operative mice, craniofacial abnormality mice or others that have challenges in reaching the water valve or feed. If you identify a need to use these products routinely, please ensure that they are defined in your approved Animal Protocol (AP). If you need assistance with this, please email iacuc@uiowa.edu. If you need assistance in obtaining or using these products, please contact your facility supervisor, veterinary technician or email OAR-Veterinarian@uiowa.edu. These products are stored at room temperature. Small weanling, debilitated mouse, paralysis, post-operative recovery, etc. Mice on special diet need additional hydration? How often to check mice after placement?